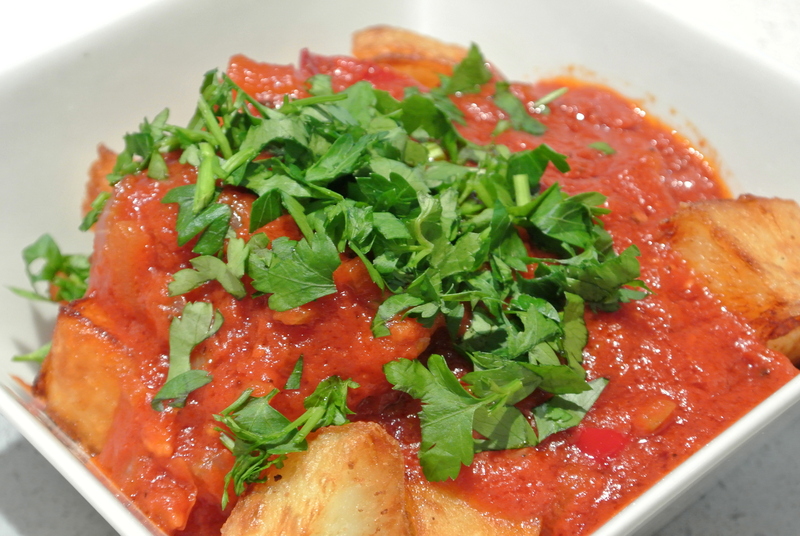 There are many versions of this tapas dishes ranging from roasted potatoes with a tomato sauce, to deep fried potato chunks served with a spicy mayonnaise-like sauce. The best versions have a deep rich spicy tomato sauce covering the crispy, bite sized potato chunks. Peel the potatoes and cut into small, bite sized chunks approx. 2cm cubed. Sprinkle with salt. Pour olive oil in a wide, deep frying pan, with a heavy bottom. Heat the oil on medium high until hot. To test the oil, carefully place one piece of potato in the oil. It is hot enough if the potato immediately fries. If there is no bubbling/frying, the oil is not hot enough and the potato will absorb too much oil. Once the potatoes are fried (about 10 minutes), use a slotted spoon or spatula to remove and set them aside to drain. (You can of course use a deep fat fryer, if you have one). To make the sauce, use a medium sized frying pan, put 1-2 tablespoons of the olive oil in the pan. Heat over medium heat. Pour tomato sauce into the pan and sauté the tomato sauce for 5 minutes. Turn heat down and add the mustard, stirring well. Finally, add the Tabasco and paprika, and mix well. Taste the sauce and adjust as necessary with salt, more Tabasco, etc. Place the potatoes on a plate or in a wide-open dish. Pour the sauce over the potatoes and serve warm, with toothpicks.